The first climate study to focus on variations in daily weather conditions has found that day-to-day weather has grown increasingly erratic and extreme, with significant fluctuations in sunshine and rainfall affecting more than a third of the planet. Princeton University researchers recently reported in the Journal of Climate that extremely sunny or cloudy days are more common than in the early 1980s, and that swings from thunderstorms to dry days rose considerably since the late 1990s. These swings could have consequences for ecosystem stability and the control of pests and diseases, as well as for industries such as agriculture and solar-energy production, all of which are vulnerable to inconsistent and extreme weather, the researchers noted. The day-to-day variations also could affect what scientists can expect to see as Earth’s climate changes, according to the researchers and other scientists familiar with the work. Constant fluctuations in severe conditions could alter how the atmosphere distributes heat and rainfall, as well as inhibit the ability of plants to remove carbon dioxide from the atmosphere, possibly leading to higher levels of the greenhouse gas than currently accounted for. Existing climate-change models have historically been evaluated against the average weather per month, an approach that hides variability, explained lead author David Medvigy, an assistant professor in the Department of Geosciences at Princeton. 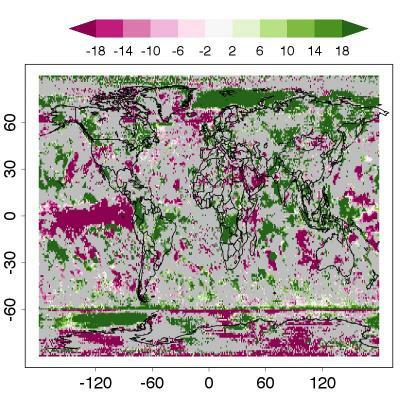 To conduct their analysis, he and co-author Claudie Beaulieu, a postdoctoral research fellow in Princeton’s Program in Atmospheric and Oceanic Sciences, used a recently developed computer program that has allowed climatologists to examine weather data on a daily level for the first time, Medvigy said. “Monthly averages reflect a misty world that is a little rainy and cloudy every day. That is very different from the weather of our actual world, where some days are very sunny and dry,” Medvigy said. The Princeton findings stress that analysis of erratic daily conditions such as frequent thunderstorms may in fact be crucial to truly understanding the factors shaping the climate and affecting the atmosphere, said William Rossow, a professor of earth system science and environmental engineering at the City College of New York. “It’s important to know what the daily extremes might do because we might care about that sooner,” said Rossow, who also has studied weather variability. He had no role in the Princeton research but is familiar with it. Rossow said existing climate-change models show light rain more frequently than they should and don’t show extreme precipitation. “If it rains a little bit every day, the atmosphere may respond differently than if there’s a really big rainstorm once every week. One of the things you find about rainstorms is that the really extreme ones are at a scale the atmosphere responds to,” he said. Although climate-change models predict future changes in weather as the planet warms, those calculations are hindered by a lack of representation of day-to-day patterns, Rossow said. 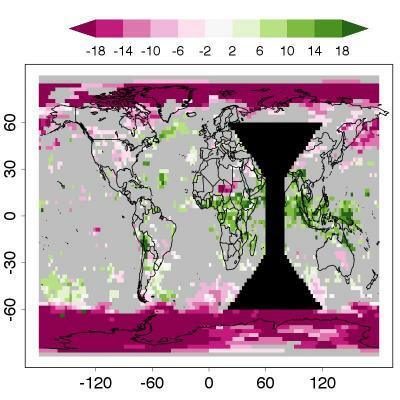 Medvigy and Beaulieu determined sunshine variation by analyzing fluctuations in solar radiation captured by the International Satellite Cloud Climatology Project from 1984 to 2007. To gauge precipitation, the researchers used daily rainfall data from the Global Precipitation Climatology Project spanning 1997 to 2007. Medvigy and Beaulieu found that during those respective periods, extremes in sunshine and rainfall became more common on a day-to-day basis. In hypothetical terms, Medvigy said, these findings would mean that a region that experienced the greatest increase in sunshine variability might have had partly cloudy conditions every day in 1984, but by 2007 the days would have been either sunny or heavily cloudy with no in-between. For rainfall, the uptick in variation he and Beaulieu observed could be thought of as an area experiencing a light mist every day in 1997, but within ten years the days came to increasingly fluctuate between dryness and downpour. The researchers observed at least some increase in variability for 35 percent of the world during the time periods analyzed. Regions such as equatorial Africa and Asia experienced the greatest increase in the frequency of extreme conditions, with erratic shifts in weather occurring throughout the year. In more temperate regions such as the United States, day-to-day variability increased to a lesser degree and typically only seasonally. In the northeastern United States, for instance, sudden jumps from sunny to bleak days became more common during the winter from 1984 to 2007. In the 23 years that sunshine variability rose for tropical Africa and Asia, those areas also showed a greater occurrence of towering thunderstorm clouds known as convective clouds, Medvigy said. Tropical areas that experienced more and more unbalanced levels of sunshine and rainfall witnessed an in-kind jump in convective cloud cover. Although the relationship between these clouds and weather variations needs more study, Medvigy said, the findings could indicate that the sunnier days accelerate the rate at which water evaporates then condenses in the atmosphere to form rain, thus producing heavy rain more often. Although the most extreme weather variations in the study were observed in the tropics, spurts of extreme weather are global in reach, Rossow said. The atmosphere, he said, is a fluid, and when severe weather such as a convective-cloud thunderstorm “punches” it, the disturbance spreads around the world. Weather that increasingly leaps from one extreme condition to another in short periods of time, as the Princeton research suggests, affects the equilibrium of heat and rain worldwide, he said. “Storms are violent and significant events — while they are individually localized, their disturbance radiates,” Rossow said. These sweeping atmospheric changes can interact with local conditions such as temperature and topography to skew regular weather patterns, Rossow said. The impact of these fluctuations on natural and humanmade systems could be as substantial as the fallout predicted from rises in Earth’s average temperature, Medvigy said. Inconsistent sunshine could impair the effectiveness of solar-energy production and — with fluctuating rainfall also included — harm agriculture, he said. Wetter, hotter conditions also breed disease and parasites such as mosquitoes, particularly in tropical areas, he said. On a larger scale, wild shifts in day-to-day conditions would diminish the ability of trees and plants to remove carbon from the atmosphere, Medvigy said. In 2010, he and Harvard University researchers reported in the journal the Proceedings of the National Academy of Sciences that erratic rain and sunlight impair photosynthesis. That study concluded that this effect upsets the structure of ecosystems, as certain plants and trees — particularly broad-leafed trees more than conifers — adapt better than others. In the context of the current study, Medvigy said, the impact of variability on photosynthesis could mean that more carbon will remain in the atmosphere than climate models currently anticipate, considering that the models factor in normal plant-based carbon absorption. Moreover, if the meteorological tumult he and Beaulieu observed is caused by greenhouse gases, these fluctuations could become self-perpetuating by increasingly trapping the gases that agitated weather patterns in the first place. “We have not yet looked for direct ties between weather variability and increased carbon dioxide concentration in the atmosphere, but I would not be surprised if they are connected in some way,” Medvigy said. The study was published online Oct. 14 by the Journal of Climate, and was funded by grants from the Princeton Carbon Mitigation Initiative and the Fonds Québécois de la Recherche sur la Nature et les Technologies.